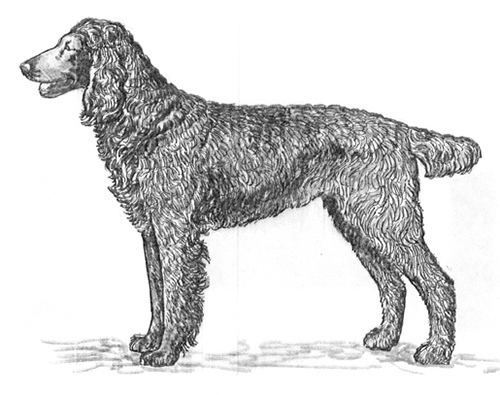 Descended from the Picardy spaniel and possibly the Barbet and the Poodle, the Epagneul de Pont-Audemer has always been a rare breed, and so few existed after the Second World War that it was necessary to breed them with Irish Water Spaniels to keep the breed alive. A water specialist, the breed is also used to point and flush. The Epagneul de Pont-Audemer was recognized by the United Kennel Club January 1, 1996. A medium sized, stocky dog with liver/brown coat that is long and wavy, but smooth about the face. Called ‘the little clown of the marshes’ in France, the breed is hardy and hard working, but has the spaniel traits of being gentle, affectionate and easy to train. The skull is round, with a prominent occipital crest. The forehead rises towards the topknot, which must be very curly and leave the forehead bare. The stop is sloping. The muzzle is long, with an arched nasal bone. The lips are fine and slightly let down, making the muzzle fairly pointed. The Epagneul de Pont-Audemer has a complete set of evenly spaced, white teeth meeting in a scissors bite. The nose is rather pointed, and protrudes in front of the line of the muzzle. It is brown in color. Rather small and well set into the sockets, the eyes are dark amber or hazel, and have a kind, frank expression. Set on rather low, the ears are long and flat, and furnished with long, silky, very curly hair, which joins with the topknot to frame the head. Slightly arched, neat and well muscled. The shoulder blades are long, sloping and fairly close together at the tips. The upper arm is strong and muscular. The legs are rather short, the dog being somewhat low to the ground, without falling into the Cocker type. The chest is deep and broad, descending to the elbow. The ribs are long and well sprung. The back is straight or slightly convex. The loin is short, broad and solid. The croup is very slightly sloping. The flanks are flat and there is a slight tuck up. The hipbones are prominent, and at the same level as the back. The thighs are muscular and fleshy, with the point of the buttocks prominent. The hock joint is broad and straight, and the rear pasterns are short and furnished with a curly fringe. Dewclaws should be removed. The feet are round, and furnished with long, curly hair between the toes. Set as a continuation of the topline, and carried quite straight. Generally docked to one third of its length, and well feathered with curly hair. An undocked tail should be medium length and carried a little curved. Brown or brown roan, with dead leaf glints. 20.5 to 23 inches at the withers.